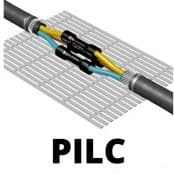 Heat shrink cable joints are suitable for jointing 3 Core PILC to PILC cables with a cable conductor range of 50-95sqmm for voltages up to 1000V. The cable joint kit offers the same benefits and comprises of similar components to those in the polymeric range, with the addition of heat shrink breakout boots, core tubes and earthing for the lead sheath on paper cables. SPS SPAP 50-95-3 is a straight (PILC – PILC) joint: transition (XLPE – PILC), pot-end and abandonment kits also available. ➡ LV Heat Shrink Joints XLPE EPR – full range of joints, terminations and connectors for medium/high voltage cables are available.